Elemental fire fans the flames of rebellion. "This is far less than we got last month," Por said, staring at the small sack of gold coins on the anvil-shaped table before her. From behind the intricate ruby-covered abacus, the foreman sniffed the heated air and regarded the coatl with a disinterested incline of his head. "There have been cutbacks across the whole mountain; many forges and railways are in need of repair materials we can only procure from other flights, so money's been tight." The thick-bodied bogsneak flicked his tail and nodded to the next dragon in line behind Por. The foreman lifted a pair of dark spectacles off his narrow eyes, "If we don't keep our equipment in order, you won't have the ability to perform your job. You could always join the bridge builders or the stonemasons, who see far less work each year than you do." He leaned in and hissed quietly, "You may be good at what you do, but no one is irreplaceable. Be thankful for what you have, snakehead." Por snatched the small pouch and stormed away. Feathers in an angry puff, she exited the foreman’s cavern. Be thankful? Snakehead?! she thought, a miniature furnace growling to life in her belly. After giving the bad news to her clan and dealing with the aftermath, Por made her way to the highest cavern in their lair to gather her thoughts. In the distance, the great smoking mountain where she and the other blacksmiths toiled each day cut a sharp triangular bite into the sky. Dark plumes of smoke choked the atmosphere, blotting out the stars above. "D'ya think that we should strike, Por? Mutiny?" came a soft voice behind her. A squat mirror with a vibrant yellow tigerhide was standing in the entrance, soot covering his gruff face. Por smiled at her cousin, Haemil. She had been holding a bitter frown for most of the day; it felt good to relax for a moment. "No. At least, not yet. The guild has a lot of leverage," she said. "The blacksmiths are the only dragons with the physical capacity to withstand the worst of the heat in the Great Furnace. Whatever is going on down there, we have one of the strongest bargaining chips there is." Haemil sat next to her with a sigh. They watched the glow of the lava flows in silence for a while before he continued, "There be rumors the forgemasters found somethin' powerful in the upper mantle. Ventrik said he saw one of them wealthier smithin' clans headin' down the Heartshaft." Por turned sharply to look at him,"The Heartshaft? No one's permitted down there but the forgemasters themselves." She stared at the dirt for a moment. "...maybe it's nothing. But we should keep an eye out anyway." Haemil nodded, turning to go. "G’night, cousin." By order of the Grand Circle of Forgemasters, the Great Furnace Forgeworks are hereby closed until further notice. “What d’ya think, Por?” Haemil whispered, side-eyeing the crowd. “I think we’ve seen all we can and should get out of here,” she said. The pair made their way to a rocky alcove, away from the furious mob. They were joined not long after by Haemil's apprentice, a lightning-fast fae named Ventrik, and their mutual friend, Howle, a burly tundra dragon with cropped black-tipped fur. "Well, Haemil, you and Ventrik here might actually be onto something," Por exhaled, "but what I don't understand is how the forgemasters can hope to keep their coffers full if productivity stops entirely. 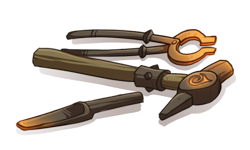 Without blacksmiths to make tools and weaponry, the Ashfall Waste will lose its ability to do business anywhere." Howle cast a look back at the throng of forgeworkers, still in front of the gates, "Do you think it's possible that they're ceasing production to drive up demand? It's hard to imagine Tempest Spire operating for very long without bolts, rivets, or sheet metal of any kind." "Artificial scarcity, then?" Ventrik mused. The group stewed in thoughtful silence for a few minutes, listening to the sounds of angry blacksmiths leaving the Forgeworks gate. Por's regarded the tiny fae. "Ventrik, you saw some of the more affluent smiths descending the Heartshaft?” He nodded in reply. She continued, “The Heartshaft heads to the Ancient Bellows, with direct access to the upper mantle. If there are any answers, that's where they'll be found." She paused for a moment, biting her upper lip before coming to a decision. "Ventrik, for the forgemasters to do what they have, it’s big. And it’s probably big enough to impact all of us, not just the blacksmiths. I doubt this is how you thought your apprenticeship would go, but you’re the only one here who can do this. We need you to get down there and find out what's going on." A pervasive grinding noise echoed throughout the massive cavern, emanating from the ancient machine in its center. A great mechanical bellows compressed and stretched, its heated exhalations blasting upwards through steel pipework that ran through the stony ceiling, ventilating the great mountain. The bellows hung by chains over a sputtering pool of lava, operated by a pair of brawny imperial dragons, their hide tattooed with ornate symbols representing the Flamecaller and her element. The natural heat of the volcano was sufficient to keep the upper furnaces and forges operating at peak potential, but in times of excess production, the Ancient Bellows provided an otherworldly warmth. Hovering around the contraption, a circle of dragons held council. The secretive group was comprised of several representatives of various well-off smithing clans and a handful of forgemasters. “Yes, Gremmich, I am confident in my assessment,” replied Perchance Smoak, not acknowledging the implied threat. "We have never encountered such a high concentration of elemental activity so deep in the bowels of the Wastes" She turned to a hooded mage next to her. "Archmage Carris here actually thinks that the elemental fluctuations are so strong that we should report this to the magisters at the Oculus. Constructing a sanctum may be necessary—"
"Let's not be too hasty! There's probably more we can glean from the readings before taking a step like that," squawked Gremmich, alarmed by the thought of them coming near his riches. He noticed Perchance staring at him with disgust. The snapper composed himself, bringing his voice back down to its normal pitch. "You also say that the natural magma from this sill, combined with this elemental essence..." he looked at Perchance, waiting for her to continue. "...could provide tempering qualities hitherto unknown and unused by our flight in all its history.” She smiled, dipping her head, “Forgemaster Maggmaw, not only does this essence appear to be an eternal source of pure flame, but it infuses any metals it comes into contact with, giving them the ability to be formed into complex shapes that would never hold under our current metallurgy processes. Why, this gift from the Flamecaller could be used to increase metalworking production by twenty fold." Gremmich's eyes glittered in the orange glow of the cavern, and the other forgemasters murmured excitedly among one another. "Meaning for each forge infused with this essence we would need only a handful of smiths, rather than the near thousands we employ now." Gremmich cleared his throat. The hooded mage leaned into Perchance and whispered something, the hint of a horn peeking out from under its robe. She nodded and addressed the others, "Of course, it will take time to understand how to best harness this new substance. Currently the essence appears to be linked with the magma flows in the cavern networks below us. The tunnels are extensive, and we will need time to determine the final destination of this new element the magma is transporting. This is a difficult procedure. If you are able to keep this confidential, the mountain must remain shuttered. After a round of whispers from the forgemasters, Gremmich's wide face split into an even wider grin, "Oh, don’t worry about us. I’m sure the Grand Circle of Forgemasters will be just fine." There was a subtle shift in a shadowed corner of the room. A tiny form slipped unseen back up the stony tunnels that led to the surface. "Despicable!" spat Por when Ventrik had returned to them that evening. His recounting of the underground meeting had sent all of them into fits of anger. "They intend to turn away nearly everyone but the most gifted. These are our friends and neighbors. Our families!" Howle was frowning, clearly upset. “Really, Por? Now? When the forgemasters be threatenin’ to take everythin’ for themselves?” Haemil snapped. “...out to sea! There’s a rift just on the edge of the Icewarden’s territory!” Por finished his thought excitedly. "Wait, Por,” Haemil said as he grabbed her shoulder. “Wouldn’t the masters already know that? The chambers been mapped already. By you, in fact!" Por crossed to a steel crate in the corner of the lair chamber and wrestled it open. After a moment of digging, she came up with an oversized parchment. Haemil's four eyes widened all at once. "Your tunnel maps! But how? Didn't you turn 'em in to the Forgemaster's office fer review and duplication?" "I brought it home with me a few weeks ago to finish the final cartographical work. By now those treasuremongers will likely have forgotten we even started the project," she grinned. Rolling it out on the cave floor, they all scanned the map of magma veins. Ventrik leapt onto the paper and pointed to an area about twenty miles off the coast. Word traveled quickly throughout the wastes. After their discovery, Por and her friends had wasted no time informing their fellow fire dragons of the greedy plot growing deep within the bowels of the volcano. "For those that trust my judgment," she had offered, "meet me at the Flintlock Fumaroles." The Flintlock Fumaroles were a series of terrestrial vents that expelled volcanic gases in quick, loud bursts. It also provided an ideal meeting place due to its unpredictable ejection patterns, and a thick layer of smoky mist that perpetually hung in the air near the water's edge. Blacksmiths and forgeworkers of all stripes littered the blackened sand. Por positioned herself on a shelf of scorched lava rock, looking over the dragons below. "Thank you all for coming. As you've no doubt heard by now, the Circle has decided that our collective talent, experience, and skills handed down to us for generations, are no longer of worth to them." A series of frustrated grunts and exclamations rippled across the crowd. Por continued, "They have put the gleam of gold above the children of the Flamecaller, casting aside the throngs of hard-working dragons that allowed them to compete in an evolving realm.” She paused, allowing her words to settle among them. “But they've shunned the wrong faction, haven't they?" Louder shouts of like-minded kinship. "They believe that the key to a stronger, more productive fire dragonflight exists in a surge of elemental essence beneath our feet. Unfortunately for our good Forgemaster Maggmaw, they don't know where it will manifest.” A smile crept over her face as Haemil, Howle, and Ventrik took their places next to her. She turned to look out across the waves and extended a pointing claw. "Any day now, the heartsblood of the Flamecaller herself will erupt from the sea! A new land will birth from the ocean! We will be ready to lay claim to it and hold it with all our might!" Por turned back to face the crowd of dragons who were hanging on to her every word. "Only by holding what they seek hostage will we compel them to negotiate!” She held for their cheer. “We are the forgeworkers! We are the blacksmiths! We swing the hammers! We stoke the flames! And we have pure elemental fire on our side! Are you with me?" The crowd roared their agreement, drowning out the waves crashing over the fumaroles. “Ha! I know Maggmaw. He can’t hear anything over the sound of gold,” Por smirked. Ventrik scratched off another day on the side of the cavern the four had claimed for themselves. “That makes ten days, Por,” Howle said. “If this doesn’t happen soon, we may lose them.” The tundra was frowning again. The ground lurched, shuddered, and the sea glowed orange. Almost exactly where their maps had designated, a miles-strong swath of water boiled angrily with spouts of steam rising into the cool air. Por's dragons took to the sky like a coordinated aerial army, watching the phenomenon gurgle into existence below them. The first jets of magma began to break the surface, cooling instantly into a small purplish-gray crag. The lava flow was faster and stronger than anything any of them had seen in their lifetimes, and the heat that emanated from the spurts threatened to knock many flyers off balance and into the boiling waters. “Haemil,” Por flew over. “This is amazing. Do you feel its power?” she breathed, her eyes fixated on the glow beneath them. Haemil cast a troubled glance towards his cousin but she didn’t see it. She was rapt, watching the magma bubble up out of the sea. It took the better part of a day for the land mass to spread and grow into the conical shape of an infant volcano, the elemental essence of fire pulsing deep in its center. As the lava cooled and the small island increased in size, the dragons began settling on the warm porous rock. They watched in awe as the eruptions continued unabated. The gathered dragons could feel their hearts beat with an exhilarating surge of power. Por landed on the easternmost peninsula of the rapidly expanding island and stared determinedly at the spiked silhouette of the mainland. Behind her, she could hear Haemil say, "They'll come for it, y'know." She flicked her tongue and shook out her feathered head in the warming air. "Oh, I know."